Not sure who caught Tony Bourdain last night on No Reservations. I usually really like the show but last night he showcased San Fransisco and it seemed as if he didn't really like it. 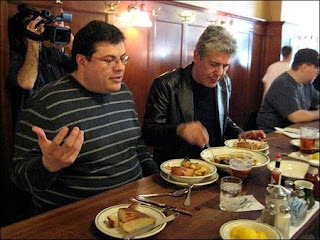 I've only been once and I certainly wasn't a restaurant enthusiast back then, but I guess I thought Anthony would have highlighted more unique or interesting food. That's besides the point. I couldn't help but notice that one of Anthony's food friends, Oscar Villalon, looked like a bizarro east coast version of The Feedbag's own Josh Ozersky. Perhaps Josh Ozersky doubles as a San Fran writer and food enthusiast. Then again, who would lead a double life in the same profession? In my double life I'd do anything but work with kids...something interesting like a an antique collector or bonsai trimmer. This is unrelated, but has anyone ever said "Congratulations" to you when you tell them who your significant other (chef) is. That has happened to me twice in the past week. It's annoying.